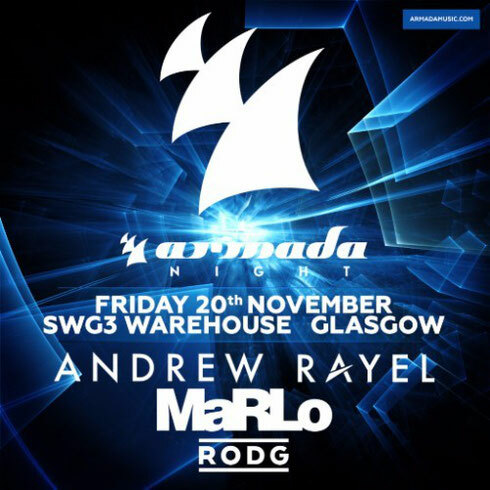 Colours and Zoom are back at SWG3 in Glasgow on Friday 20 November as they present Armada night, with DJs Andrew Rayel, MaRLo, Rodg and residents. Andrei Rata, better known as Andrew Rayel, studied orchestral music and kicked off his producing career at only 13 years of age and it didn’t take long for him to translate his ideas into sounds as his production career progressed. Dutch born, Australian raised MaRLo has apparently established himself as the #1 Trance DJ in Australia. From Beatport #1’s to headlining dance events around the world, he takes influences from trance, tech trance, hard trance and big room to form his own sound. Dutchman, Rodg, born Rogier de Kreuk, is apparently one of the best kept secrets of the Armada Music roster, but if you look into his discography and accomplishments, you’ll find that there’s much more than meets the eye. The upcoming A State of Trance 650 Warm-up Sets (Mixed Live by Armin van Buuren) are full of Rodg productions. With a string of features on Armada compilations of all kinds, he epitomises the chill-out vibe that is so widely known and loved around the world. Laid-back and effortless, his productions capture the sound of summer.